The weather here in Dominican Republic is tropical. It is hot and hotter. The temperature average is 87° degrees Fahrenheit / 30° degrees Celsius. For the high, 72° degrees Fahrenheit / 17° degrees Celsius for the low. The Dominicans love talking about the weather, just like anywhere throughout the world. You might see them wearing a sweater or even mittens while the tourists are wearing shorts and basking in the sun. 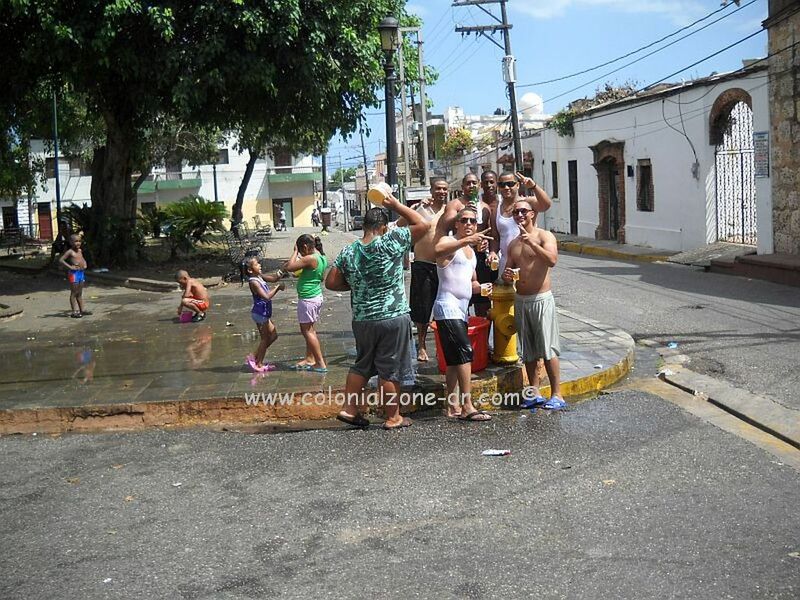 The Dominicans will be saying it is cold and the tourists will be sweating. It is all a matter of perspective. Beat the heat on a Sunday afternoon. 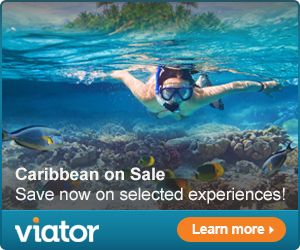 There are many temperature variations depending on where you are located throughout this large Caribbean island. Coastal areas are hotter than in the mountainous areas. City areas are hotter than the countryside. 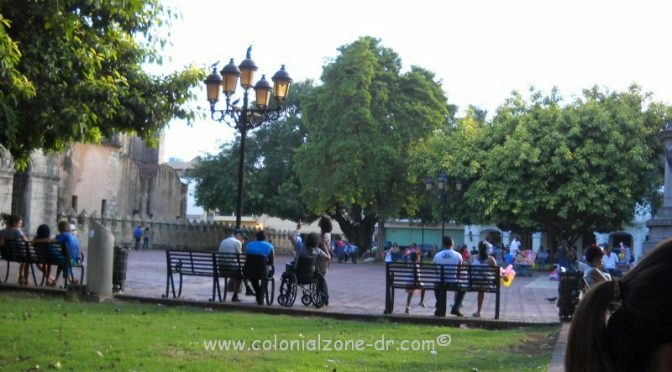 The Cordillera Central mountain region is the coolest spot of the country (Jarabacoa and Constanza) where the average temperature is 61° F / 16°C. There has even been a few frosty mornings in the higher altitudes. Sitting water (in a bowl or bucket) can freeze at night in the mountains but it will melt fast as the sun rises. Remember this if you are planning on leaving the coast. Take appropriate clothing with you. Along the coast the weather is usually warmer. There is usually always a breeze coming off the water. Depending on the time of year a sweater or light jacket may be needed in the evenings. In the desert regions of the southwest are the highest average temperatures. Temperatures can reach above 104°F / 40°C. There is not much fluctuation in temperatures here in Dominican Republic. It is the humidity that changes. 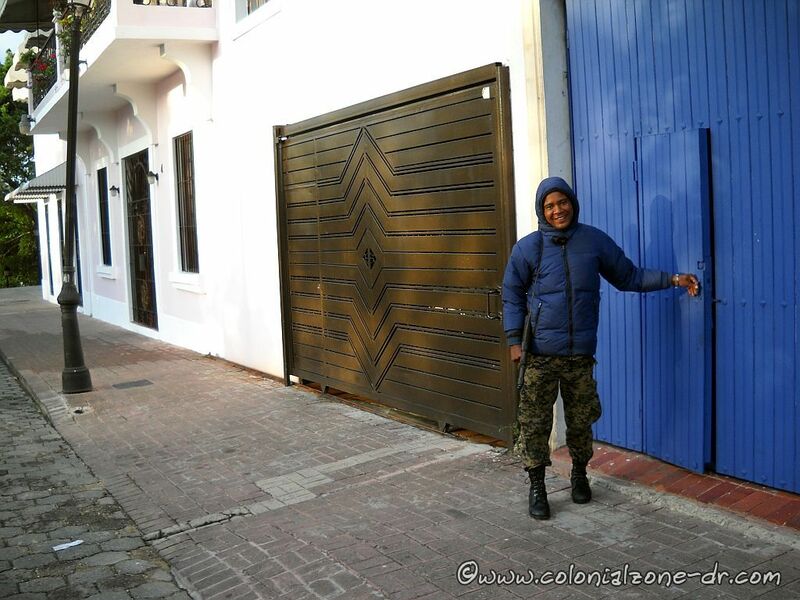 A Dominican man wearing his winter jacket in March. He said it was cold. The winter season, November thru April, is cooler and less humid. 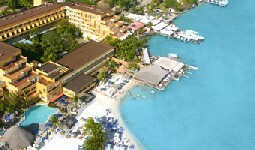 It is the most popular time for tourists arriving to Dominican Republic. The summer season is May to October. It is humid with more rain. Be prepared to sweat because of the very high humidity. The rainy season is normally in the spring but the weather patterns are changing. Along the northern coast, the rainy season lasts from November through January. In the rest of the country, it runs from May through November. May is normally the wettest month. When it does rain it is usually not for long, unless there is a tropical depression or hurricane happening. The sun usually shines and there are very few days of complete cloud cover. When on vacation there is a very good chance one will be able to get that much desired tan. Make sure to bring the sunscreen as the tropical sun is very hot. Another thing to remember is when you come on a vacation bring the mosquito spray. Something with DEET is suggested. If you are sitting on the beach where there is always a breeze you will usually not be bothered by the mosquitoes and no-seeums. If the breeze stops of if you leave the resorts you WILL notice the mosquitoes. Most resorts spray for these pesky little buggers but when trekking away from the tourist areas it is wise to be prepared. The Latitude and Longitude of Santo Domingo, Dominican Republic is 18.4° N 69.9° W.
It is very good to know the location of places in the Caribbean for weather, storm and emergency alerts. Most weather advisories are in the local time zone of where the storm is located. Many times the weather service uses Zulu Time (Z) or Coordinated Universal Time (UTC), formerly known as Greenwich Mean Time (GMT). Dominican Republic is in Eastern Standard Time (EST) and they do not change the time for Daylight Savings Time. For Dominican time subtract 5 hours from UTC (ex. if UTC time is 11 AM the time in Dominican Republic is 6AM). Most weather alerts will say Dominican Republic or República Dominicana. There can also be alerts for Hispaniola, which is the name of our island. We are also known as the Greater Antilles, the island chain that includes Cuba, Jamaica, Hispaniola (Haiti and the Dominican Republic), and Puerto Rico. Water surrounds the island on three sides. The Atlantic Ocean to the north, The Mona Passage which is the water pass that divides Puerto Rico from Dominican Republic and the Caribbean Sea on the south. We can get many different storms coming from all different directions. *This formula is an calculation which could be difficult unless you are a mathematician or have a pencil and paper. *A little easier yet exact if you double the Celsius, minus 10%, plus 32° = Fahrenheit. i.e. 26° Celsius x 2 = 52 – 10% = 47 + 32 = 79° Fahrenheit. *The easiest and fastest calculations to figure the exchange but not as precise. To change Fahrenheit to Celsius subtract 32 from the degrees Fahrenheit, divide the answer by 9, multiply the answer by 5 and you have it. Dominican Republic has a Civil Defense Division / Defensa Civil República Dominicana. They set up evacuation routes and shelters as determined by the weather and need. You just have to keep listening to the radio and people talking to find out exactly where to go and what to do in the event of an emergency. 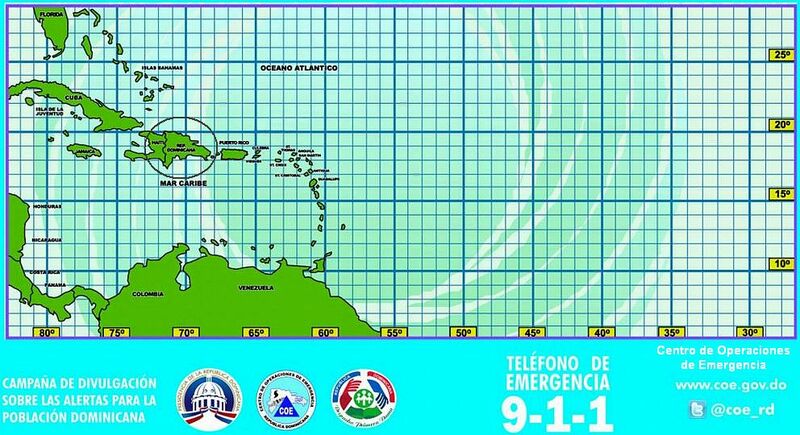 The Defensa Civil / Civil Defense of Dominican Republic has set up an alert system for emergencies. Weather, beach conditions and more are covered under this system. They place different flags on the beaches and other areas when the weather gets rough. ALERTA VERDE / GREEN ALERT – Is to alert that there is a chance or they are expecting a state of emergency that could be happening. This is the lowest alert and lets one know to pay attention to what is or could be coming. ALERTA AMARILLA / YELLOW ALERT – To warn if the development persists or continues to develop there is an eminent risk of danger. This is the second warning and is to be paid attention to very closely as the civil defence thinks that this is an emergency developing. ALERTA ROJA / RED ALERT – This is to say that this is a serious threat to an area and the people and properties and environment in an area. This is a serious warning. If you are on a beach area DO NOT go into the water when this alert flag is up. Centro de Operaciones de Emergencias (COE) is a great place to check when there are weather alerts. The page is in Spanish but it will tell you what areas are having storm warnings. They will give the areas the color rating above and state the locations where there could be potential problems. 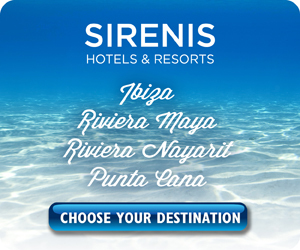 Click on the section that says “ALERTAS” and you will view all the updates. Click on the newest link and read the updates on the weather situation. They are very efficient in posting their alerts. 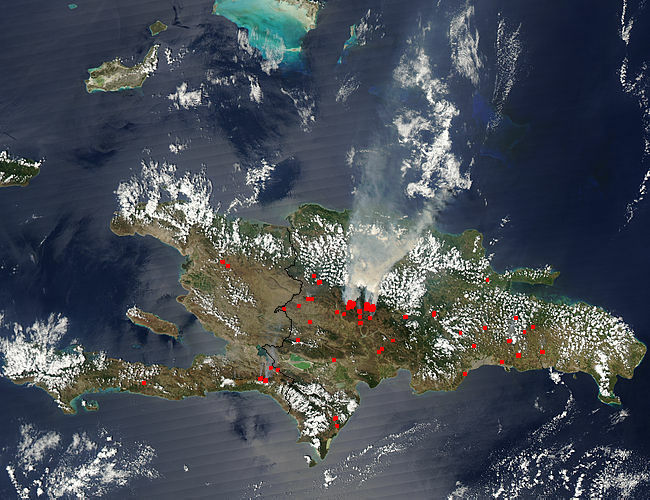 Satellite picture of Wildfires in Dominican Republic taken on March 18, 2005 from a satellite provided by NASA. This is when we had many wild fires during the dry season running from December to May for most of the island.